Rush the place and lead your hero to the red flag in the end. Collect yellow stars during your adventure and hold the mouse button to set the power of the jump! 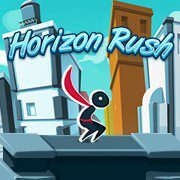 Rush the horizon and collect all yellow stars. Step on the dangerous road with a shiny cape on your back and show everyone that you are worthy. Run forward, dodge the obstacles and gaps and set the power of the jump to complete the objective of the level. When you are done, touch the red flag and finish the level!